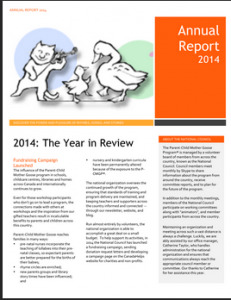 In December, 2014 Canada’s National Council for the Parent-Child Mother Goose Program held its Annual General Meeting and released its Annual Report for 2014. Among the initiatives we’ve undertaken recently is an ambitious fundraising campaign. The goal? To be able to keep on advocating for Parent Child-Mother Goose, maintaining certification and training standards as well as high standards of program delivery across the country, and to continue to ensure that Parent-Child Mother Goose is delivered free of charge to families in communities throughout Canada (we told you it was ambitious!). We’re pleased to announce that as of February 1, 2015, a total of $1,700 has already been donated to help support the National Parent-Child Mother Goose Program! We’re thrilled at the wonderful response and by the recognition from our supporters of the key role that the National Parent-Child Mother Goose Program plays in keeping teachers and agencies across the country informed, up-to-date, and engaged in providing the highest quality free community programming for parents and their young children. Now we’re asking you (our online readers) to help keep the momentum going! Visit our CanadaHelps campaign page to make an online donation to show your support for Parent-Child Mother Goose! Now donation is too small — we’re a small, volunteer-run organization, and just a few dollars from you today can make a big contribution to our work all year long. This entry was posted in Latest News on February 1, 2015 by marilee.